Traditional industrial sensors, whether incremental or absolute, can meet the needs of many general / industrial motion control applications. However, these devices are more likely to fail when placed in operating environments that subject them to hot temperature, high shock & vibration, aggressive contaminants, long-term submersion in liquids & water vapor, or EMI noise. When traditional sensors fail, downtime costs related to sensor failure can quickly grow to several times the cost of the sensor itself. 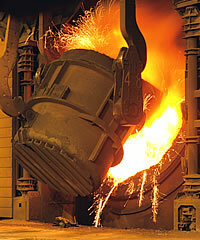 Sensor failure would eventually cause extensive damage especially iron and steel industry. NSD's outstanding durability is achieved by a creative construction of the design which eliminates contact parts and zero electronic components inside sensor, and ABSOCODER has been field-proven with excellent durability & extremely long-term lifespan at steel make industry.